Don't miss the BEAST! 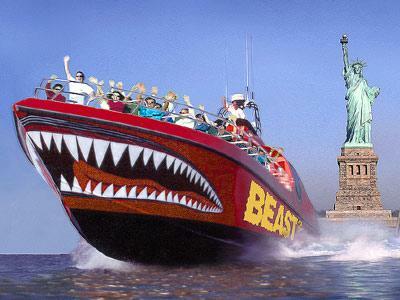 New York's very own thrill ride. 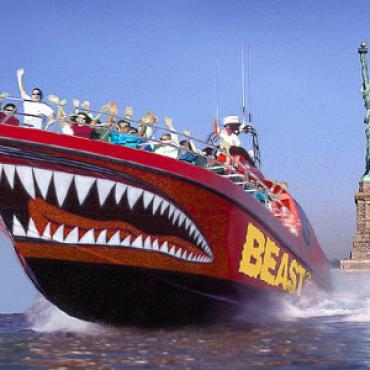 ''Mad Dog,'' your daring captain, will take you for a wet n' wild ride through the New York harbour. Hold onto your hats because for 30 fun-filled minutes, you'll be soaring past the skyscrapers at a heart-pounding 45mph. We'll stop for a close-up of the Statue of Liberty where you'll have a quick photo-op. It's a pure thrill! Departure daily every hour between 12pm - 7pm (May through October, in October weekends only). Please note the Height Restriction: You must be at least 40'' / 100cm tall to ride the BEAST.